“I would say, no, I hadn’t met God,” he says. “Now many young mothers introduce me to their kids and tell them, ‘this uncle has been to the Moon!'”. “It was completely over the top. It left me irritated and tired. I had to keep a smile on my face all the time,” he recounts. Mr Sharma wears his achievements and fame lightly. He joined India’s air force at 21 and began flying supersonic jet fighters. He had flown 21 missions in the 1971 war with Pakistan before his 23rd birthday. By 25, he was a test pilot. He travelled into space at 35, the first Indian and the 128th human to do so. What is easily forgotten is that Mr Sharma’s feat was possibly the only silver lining in what was one of independent India’s worst years ever. The anti-Sikh riots, the country’s worst religious rioting after Partition, convulsed Delhi. And, before the year had ended, thousands of people in the city of Bhopal had been killed after toxic gases leaked from a chemical factory, the world’s worst industrial accident. Mr Sharma was picked to undergo a battery of gruelling tests from a reported shortlist of some 50 fighter pilots. Among other things, he was locked up by the air force in a room with artificial lights at an aerospace facility in Bangalore for 72 hours to test for “latent claustrophobia”. In the end, two of them were selected for the final training in Russia. It was bitterly cold. He trudged in the snow from one building to another – “It was very Dr Zhivago”. “It wasn’t such a big deal, it wasn’t very tough,” says Mr Sharma, modesty. But many, like science writer Pallava Bagla, believe Mr Sharma’s feat was a “huge leap of faith”. “The take-off was boringly routine. We were over-trained by that point,” Mr Sharma recounts. Two years later, in 1986, the Challenger space shuttle broke apart over a minute after its launch, killing all seven US astronauts in flight. Mr Sharma is now among the more than 500 fortunate people who have travelled into space since Yuri Gagarin’s single orbit of Earth in 1961. Tragically, Mrs Gandhi would be murdered within eight months, and her son, Rajiv, would sweep the polls at the end of the year on a sympathy wave for his mother. The space flight wasn’t needed to fetch votes for the ruling Congress party. He became the first human to practice yoga in space – using a harness to stop him from floating around – to find out whether it could better prepare crews adapt for the effects of gravity. He spoke to his family once on a live link with 2,500 people in the audience in a Moscow auditorium. “Sare Jahan Se Acha [The best in the world]”, he said, quoting from a famous poem by Mohammad Iqbal, which he had recited every day in school after the national anthem. “It was top of recall. There was nothing jingoistic about it. India does look so picturesque from space,” Mr Sharma told me. 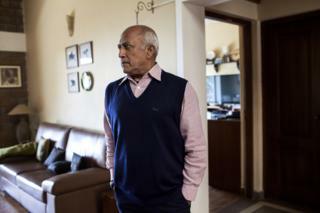 The New York Times presciently wrote that “India is not likely to have its own manned space programme for a long time, if ever, and Mr Sharma’s flight may well be the last by an Indian for a long time.” Forty-three years later, Mr Sharma remains the only Indian to travel to space. Eight years ago, the space hero retired and built himself his dream home, with sloping roofs, solar-heated bathrooms, harvested rainwater, handmade bricks excavated from the plot, and a sunlit study stacked with his favourite books and music. He lives with his interior designer wife, Madhu, and their pet dog, Kali. A Bollywood biopic is “in the works”, with star Aamir Khan rumoured to play the astronaut. “I would love to,” he says, looking out to the hills from his sprawling balcony.